There are some things in life you can’t have too much of. You can’t have too much fun. You can’t have too much wisdom. You can’t have too much love. My university invested a ton of money to upgrade to Conference USA. We won our bowl game in Florida this year too. Did you watch our team win? Probably not. Turns out attendance at the plethora of Florida college bowl games is down. “When the Outback Bowl in Tampa announced an attendance of 51,119 on Monday who watched Florida dismantle Iowa 30-3, it became the sixth college bowl game among eight in Florida to have a decline in attendance from the previous year,” reports the Florida Times-Union. Rolling Stone magazine wrote that one of the big stories of 2016 was the decline in viewership of the NFL. How big was the decline? Down 8%. Prime Time games were down the most with an audience erosion of 10 to 12%. The Federal Highway Administration says that by 2025 passenger miles traveled will have increased 72%. Why? Because that same agency says our population will have increased by 26% by that same year. Tell me the road you commute to and from work isn’t already over congested. Why is Country Music not the Top Radio Format in Nashville? Nielsen Audio did a research study in 2014 and said the top radio format in America was country music. Ironically, the top radio station in Music City aka Nashville was NOT a country station. And it’s still not. The latest ratings for Nashville show the highest rated country music station is ranked #7. The following radio formats are all ahead of that country station: Adult Contemporary, CHR, Sports, Urban AC, Talk and Variety Hits. However, if you combine all of the audience of the many country format radio stations in Nashville, you will have a higher share of audience than the number one radio station commands. So while you cannot have too much fun, wisdom, or love, you can have too many choices of products and services. Great for consumers’ maybe, but not for business owner/operators. Ask those who are dealing with the increase in college bowl games, NFL games, traffic congestion or playing country music in Nashville. Radio is experiencing its own issues with supply versus demand. The FCC will open up two windows for new translators this year. That’s after 750 new FM translators were signed on in 2016. Currently there are 19,778 FM signals beating the airwaves throughout America. Compare that to 4,669 AM radio stations currently on the air. At the point in America’s history when the same number of AM radio stations equaled the number of FM radio stations on the air in America (end of 1992), 75% of all radio listening was to FM radio. This brings me back to my own undergraduate college days and psychology class. I remember learning about an experiment about putting too many rats into a confined space. “As the number of rats rose above a certain level, the effects became rather dramatic,” wrote Albert J. M. Wessendorp, Psychologist-Psychotherapist. The rats displays behavioral disturbances, death rates rose, male rats began to show deviant sexual behavior and more. You can read more here. Whales are known to commit collective suicide in order to control overpopulation. What about you and me? How are we impacted by overpopulation (or over choice)? I love the radio business. I share these thoughts because I’m concerned that the current overpopulation of the FM band is not taking into consideration the laws of physics or the impact of anything that gets overpopulated. Have you looked at the revenue forecasts for radio for 2017? Are you feeling threatened yet? Next week I will continue with this topic and offer up what I believe is a solution to radio’s problem in an overpopulated entertainment world. That was the headline that appeared in the Baltimore Sun on January 7, 2004. Unfortunately, unlike HDTV (High Definition Television) HDRadio never stood for “High Definition” radio. And maybe that was the first mistake. HDRadio was simply a name they chose for the digital radio technology. The iPod was introduced in October 2001. Steve Jobs introduced this music delivery changing device this way. Only a month earlier, XM began broadcasting the first satellite radio programming to be followed four months later by Sirius satellite radio. So by 2004, digital radio was already late to the party. KZIA-FM Z102.9 saw Kenwood USA sell its first digital receiver in Cedar Rapids, Iowa to take advantage of KZIA-FM’s HDRadio broadcasts. “This is a significant move,” Michelle Abraham, senior analyst at In-Sat/MDR, a market research firm in Arizona, said of the roll-out of digital radio equipment. “It may not seem duly significant in the beginning, but in a few years from now, it will be a huge leap.” The hope was it would prove to be competitive to the newly launched satellite radio offerings from XM and Sirius (now merged into a single satellite company). HDRadio was also seen as improving FM to have CD quality sound and making AM sound like FM. It was heralded to help struggling AM radio stations. What HDRadio did for FM radio stations was solve a problem that listeners to FM didn’t feel existed. No one who listened to FM radio was complaining about the quality of the sound of the transmission. (They were complaining about other things, like too many commercials.) And for AM radio stations, it meant people buying radios for a service that didn’t offer anything they really wanted to hear or couldn’t get from someplace else. AM radio was now the service of senior citizens who already owned AM radios, who grew up with AM radio’s characteristics and whose hearing was not the best now anyway. So HDRadio for AM wasn’t something they were asking for either. Worse, AM radio stations that put on the new digital signal found it lacked the benefits of skywave and often interfered with other company AM radio stations as the industry quickly consolidated radio ownership. In March 2016, an article published by Rhys Grossman in the Harvard Business Review listed “Media” as the most disrupted by the growing digital economy. Turns out if you’re a business to consumer business, you’re the first being most disrupted by digital. The barriers to be a media company used to be huge, but in a digital world they are not. The business model that media companies depend on has not adapted well to the digital economy. Having moved from media to education I only got ahead of digital’s disruption for a while. But even those industries that had perceived high barriers of entry are finding those walls crumbling quickly. Grossman says fifty percent of executives see education being impacted in a big way in the next twelve months. Edison Research did their latest “Infinite Dial” webinar and the slide that most impacted me was the one about radio ownership. From 2008 to 2016 the percentage of people in America that don’t own a single radio in their home has gone from 4% to 21%. When Edison narrowed this down to household between the ages of 18-34, non-radio ownership rose to 32%. Mark Ramsey’s Hivio 2016 Conference had one Millennial describe a radio set as being “ancient technology.” Ouch! It doesn’t seem all that long ago that Jerry Lee’s WEAZ in Philadelphia was giving away high quality FM radios to increase listenership to not just his radio station but to FM radio. And KZIA in Cedar Rapids gave away HDRadios to allow people to hear their new signal. It now appears time for the radio industry to begin giving away AM/FM radios every time they are doing station remotes, contests or appearing at venues that will attract lots of people. But the elephant in the room remains the broken media business model. Newspapers, magazines, radio, and television – any media that is ad supported – will be challenged to find a way to capture revenue to continue. To anyone in ad supported media, we would agree we do it for the same reasons. The $64,000 question is how. Are We Losing the Next Generations? 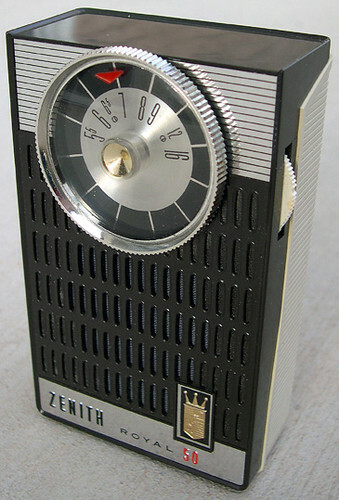 Growing up in western New England, the transistor radio would impact my life and career. Radio has been in my blood as long as I can remember, but it would be my Zenith transistor radio that would first allow me to explore new stations, new music, new personalities and new ways of delivering content without the supervision of my parents. My transistor radio and ear piece would make me the master of my own radio dial. Growing up, it seemed like most radio markets had two radio stations battling for the teenage ear. WPTR and WTRY out of Albany, New York’s capital district would be mine. Each of those radio stations would bring their mobile studios to our county shopping center and broadcast LIVE. It was such a thrill. Hartford had WDRC and WPOP. Boston had WMEX and WRKO. Philadelphia had WIBG and WFIL. Chicago had WLS and WCFL. New York City would finally be a battle between WMCA and WABC for the Top40 crown in the Big Apple. What made traveling around in my folk’s car so exciting was that each of these radio markets and radio stations were special and different. The personalities, the promotions, the station jingles and yes, even some of the music was unique to each station and market. Local and regional bands could be heard hoping to be discovered and go national with their music. Radio stations all did music research back then and printed weekly surveys charting how the hits were doing from week to week with local listeners. I’ve sold “old people radio formats” where the presentation was quick to point out that what advertisers should be focused on is not the age of the audience but the amount of money they control and have as discretionary to spend as they wish. Radio has always focused on the “family reunion demo” aka 25-54 adults; though that demo is shifting upwards with the aging baby boomers to 35-64 adults. It should also be noted that around the time Radio Disney was coming into existence that the radio ratings company known at that time as Arbitron began to measure listening audiences down to age 6+ with their new PPM device where as the diary previously only measured “adults 12+.” When Nielsen bought Arbitron and rebranded the radio ratings service Nielsen Audio it kept the 6+ listening metric. Nielsen also now is trying to establish a listening service that will measure all audio listening consumption across all platforms. Can you see where this is going? Radio listening is a habit. My father never acquired it. I was raised on it. My sons were raised on it. But I see my grandchildren are holding iPad-like devices and easily navigate their parents’ iPhones. You would have thought that with more radio stations on-the-air in America than at any time in history there would be more variety than at any time in our history, but that’s not the case. There’s actually less variety. After launching two Smooth Jazz formatted radio stations and falling in love with the artists and their music I now can only hear this music streamed online. So like my grandchildren, I’m forming a listening habit that doesn’t require a radio; just my iPad or iPhone. I believe the future is going to be all about being the best at something, not necessarily garnering the most people. Radio was always about getting the most ears. Everything was based on CPP (cost per point), but in a world of infinite choice, the best will dominate. Radio can play in this world if programming is turned back over to people who program their passions to others just like themselves. Steve Jobs made Apple into the world’s most valuable company by focusing on design (in radio, that’s programming) and making products that he and his team wanted to have for themselves (building a radio station that you not only own, but love to listen to yourself). Radio is either going seize the day or have a seizure. Are We the Solution or the Problem? It's Better Than Working For A Living!